With a title like that, I don't know how you could not want to read it. Seriously. As it turned out, despite the adorable bunnies on the cover, Aaron would most definitely not have understood much about this book, especially the hippie, irresponsible parents (who may or may not be a little high on drugs). So I'm glad I didn't dive into it with him. But I am glad I read it myself. I maybe laughed my head off in a few places. Madeline is a young girl with ridiculous parents. How ridiculous? They insist on being called Flo and Mildred (not Dad and Mom), they don't keep track of anything (addresses, appointments, etc. ), and they would rather spend their time making paper lanterns than working a real job (or paying attention to Madeline). In fact, they're so ridiculous, they end up being kidnapped by a group of power-hungry, and also just plain stomach-hungry, foxes. Madeline knows her parents will never be able to save themselves, so she tackles the problem herself. 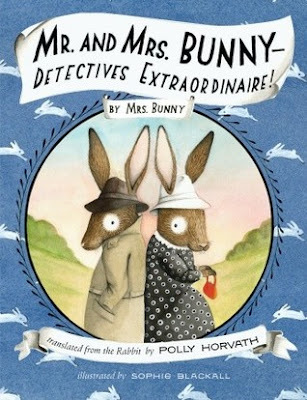 Fortunately, she runs into Mr. and Mrs. Bunny, who, even more fortunately, have just purchased fedoras and decided to become detectives. Madeline hires them on the spot, and the three put their heads together to find the diabolical foxes. Okay, so if you want a taste for what this book is like, just picture a rabbit in purple platform shoes and a fedora driving a smart car. (He has to wear the platform shoes in order to reach the pedals.) I wish I had a hard copy of the book, so I could quote a few passages for you, but what I just described actually captures the flavor of the book really well. So, yes, it is uproariously funny, but not in a way that a four-year-old would get at all. In fact, I'm trying to think which age would enjoy it the most. Maybe 9-12 year-olds? (I think that's who it's written for at any rate.) That is, if they don't feel too self-conscious reading a book with bunnies (in fedoras) on the cover. But I don't know. In all honesty, it was pretty down-right enjoyable as an adult. The audio is narrated by Polly Horvath. I always love it when authors narrate their own books, and this one was no exception. I especially loved the voices she used for Flo and Mildred. They were so perfect and seriously made me laugh every time. All in all, this is a fun book, and it makes me want to read some more by Polly Horvath. Note: This book is also my third potential-Newbery read of the year. I wanted to read at least three before the award is announced in January. Of the three I've read, I think Wonder has the most likely chance, but there are still several more contenders I hope to have time for. What? I must get this! Running off to add it to my TBL. My only regret with listening to the audio is that I didn't get to see Sophie Blackall's illustrations! (Oh, and also that I didn't get to record some of the really memorable lines.) This is my first Polly Horvath as well, but now I want to read some more.